Ron Dennis smiles, Ron Dennis cries. That must have been the McLaren boss's sentiment after the Japanese Grand Prix. On the one hand Kimi Raikkonen drove at his very best to claim McLaren's sixth consecutive victory, but on the other Juan Pablo Montoya's early retirement and Renault's two-three finish meant the Constructors' Championship went in Renault's way once again. Raikkonen's win from 17th on the grid was without a doubt the single best performance of the year and tied for fourth in the list of Formula One World Championship wins from furthest down the grid. While Raikkonen's victory was undeniably deserved, there's always the criticism towards Giancarlo Fisichella for giving up the win at such a late stage. However, one has to wonder whether that was actually the thing that decided the race. The period around the first pitstops seems to have been much more instrumental in Raikkonen's victory. When Fisichella had stopped, it was Alonso, Schumacher, Raikkonen, Fisichella from fourth. This was the first small victory for Raikkonen as there was no Fisichella to give Alonso any kind of breathing space for his pitstop. Obviously this was a tactical choice of Renault to give Fisichella a longer second stint and thus having him make a slightly longer pitstop. Next vital period was the four-lap period between the stops of Alonso and Raikkonen. While Alonso was stuck first behind Felipe Massa and then behind Jacques Villeneuve, he lost 5.141 seconds in three laps time of which one was Raikkonen's in lap. Add to that another 1:35 stuck behind David Coulthard while Raikkonen pitted and it's easy to see that the World Champion would have been in front of Raikkonen had this played less part in his race. Renault's strategy put Alonso in a very awkward position after his stop, making it unable for him to put in enough good laps to stay ahead of his rival. Obviously the strategies were partly written because of the peculiar qualifying circumstances, but they really seem to have worked against Renault. Now they head for China with a two-point lead that could well have been ten. While Jenson Button's fifth place in itself looked like little more than just another solid race for the BAR driver, it meant a continuation of the Briton's recent string of successful races. Button now has nine consecutive point finishes, tying his previous record which he set from Japan 2003 until Canada 2004. With his future now secured at BAR, we might just see the relieved driver celebrate his 100th race in China with a tenth point finish. This week in 1987 the Mexican Grand Prix was held as round 14 of the Championship. With three rounds to go, Nelson Piquet was the clear leader with 70 points against his Williams teammate Nigel Mansell's 52. In third, just one point behind Mansell, it was Lotus driver Ayrton Senna. The only driver with a theoretical chance for the Championship was McLaren's Alain Prost, who was fourth with 46 points. The weekend started with a little bit of politics that had little to do with the Championship contenders. With the field down from 28 to 27 cars due to the absence of Coloni, most teams voted for all cars to be allowed on the grid, rather than the usual 26. However, Benetton didn't support the vote and thus there had to be one unlucky driver sidelined after the Saturday. In first qualifying, Gerhard Berger in the Ferrari was the surprise leader. The Austrian was the only driver to clock a time under 1:20, with Prost second, ahead of both Williams. However, the dust on the track made sure that it would only get faster and faster throughout the weekend and that as a result of it the Friday times were almost certainly to be discarded. With no surprise rain on Saturday, exactly that happened. All but Stefan Johansson (McLaren) and Osella driver Alex Caffi improved their times significantly. Nigel Mansell grabbed pole position by less than a tenth of a second from Berger, only to wreck his car right after doing so. Another driver who suffered some damage was Ayrton Senna, who planted his Lotus in the tyres on the last corner and climbed out quite shaken. The Brazilian was unable to improve his unusually low qualifying position and had to start the race from seventh place. However, the big fall of second qualifying came for McLaren. Second and ninth after day one turned into fifth and fifteenth as Johansson was unable to improve and Prost saw two Williams and the Benetton of Thierry Boutsen move ahead of him in a top five that was covered by less than four tenths of a second. The unlucky non-qualifier was AGS driver Pascal Fabre, who missed the cut for the third time in the season. The Frenchman in the end was a full second slower than number 26, Alex Caffi. On race day it initially seemed Mansell would grab the lead from the start, but excessive wheelspin saw him passed by Berger, Boutsen, Piquet and Prost before the first corner. However, before the first lap was over the top five looked completely different. In an early attempt to pass Piquet, Prost lost all grip on the dirty part of the track and slid into the Williams. While Piquet managed to rejoin after the field had passed, Prost was out on the spot with suspension damage. The whole incident had left the two cars ahead with a seven-second lead as they completed lap one. Behind Berger and Boutsen, Nigel Mansell was the first of the poursuivants, with Michele Alboreto in the Ferrari behind him, closely followed by Senna and Teo Fabi in the second Benetton. On the second lap, Boutsen squeezed ahead of Berger, but a lot more happened far behind them. While Senna moved past Alboreto for fourth, his teammate Satoru Nakajima completely missed his braking point and ploughed into the back of Derek Warwick's Arrows, taking the Briton's rear wing off. In the mayhem, McLaren's Stefan Johansson took evasive action and upon returning to the track collided with Zakspeed driver Christian Danner, eliminating both cars. Over the next few laps the only thing of interest was Brabham driver Andrea de Cesaris moving up, first past teammate Riccardo Patrese, then Fabi and finally past Alboreto into fifth place. Fifteen laps into the race Berger became the sole leader when Boutsen retired with electronics problems. By then Mansell was almost 16 seconds behind, with Senna and de Cesaris battling for third almost half a minute behind Berger. Piquet, meanwhile, was going like a maniac, setting the fastest lap of the race as he drove in seventh place, almost a minute behind Berger. Berger's joy didn't last long, though. After 21 laps it was all over for the Austrian as he was forced to park his smoking Ferrari. Two laps later de Cesaris became the next victim of the race. The Italian climbed out of his crashed car with the proverbial smoke coming out of his ears. What had happened was that Senna had missed a gear and lost traction. De Cesaris had seen his chance, moved in for the pass, only to find Senna brutally slamming the door on him and send the Brabham into the gravel. Shortly before the halfway point everyone's breath stopped as attention was once again focused on Derek Warwick. Coming out of the final corner, the Arrows driver had lost it, going hard into the tyres and bouncing back out on the track. For a while the driver sat in the car without moving, but in the end Warwick crawled out of the car on his own and made his way to the pits with only a slight limp. After that all sort of trouble were encountered as the vehicle was moved into a safe place, to the point where the race actually had to be red flagged three laps later. Half an hour later the track was deemed safe again and the race was restarted with the cars in their positions and with the two parts aggregate time forming the race result. Piquet, fourth when Warwick crashed, immediately moved ahead of Mansell, who obviously only had to follow as he had a 40-second lead from the first part. The second part could have been a tactical game, but the large differences made it less exciting. Piquet's march up the field continued as he easily moved away from Riccardo Patrese, who'd had a small lead in the first part, and Ayrton Senna spun into retirement. In the end Mansell was left with a 26-second lead to score his 13th victory. Piquet finished second, with Patrese a minute behind him on aggregate. The top six was rounded out by Eddie Cheever (Arrows), Fabi and Lola driver Philippe Alliot as only nine cars reached the chequered flag. 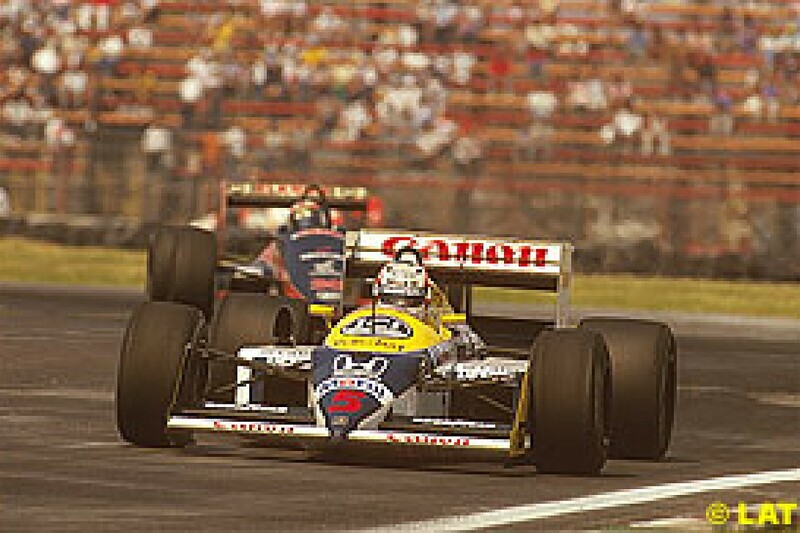 This eliminated both Senna and Prost from the Championship battle, making it an affair between both Williams drivers, with Piquet leading by twelve with two races to go.